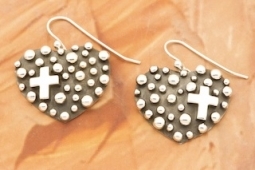 "Million Drops Collection" featuring Silver Heart Earrings with a Sterling Silver Cross Design. Created by Santo Domingo Artist Raymond Coriz. Signed by the artist.